This year we will (again) elect a new mayor. If there is anything we learned from the short stint of former Mayor Bob Filner is the incredible power that a mayor welds in transforming a city in very short order. We have two council members vying for your vote. Both ride a bicycle: one to work regularly, and one typically on the weekends. Both have consistently voted in favor of supporting bike issues since we began tracking their voting record. So which one of them should get your vote? Which one of the candidates will ensure that San Diego becomes a world-class city for bicycling? Councilmember David Alvarez regularly rides to work at City Hall and has been in office since December 2010. In his Blueprint for San Diego’s Future, he details a very comprehensive vision for our future. Councilmember David Alvarez (on bicycle). Photo via his facebook page. Creating a bike and pedestrian friendly San Diego: Increasing “active transportation” like biking and walking helps reduce traffic and promotes health and fitness. Bicycle and pedestrian-safety initiatives, improving bicycle infrastructure and launching the city’s bike-share program will make it easier to bike and walk to and from work, the grocery store, schools and other destinations. We know that bikeable, walkable neighborhoods are shown to improve local economies, so bike initiatives aren’t just for quality of life and air pollution reduction, they make business sense as well. Vision Zero for safe rides and walks: As Mayor, David Alvarez will partner with bicycle and pedestrian advocacy organizations to improve our neighborhoods He’ll adopt the “Vision Zero” platform with a goal of zero bike and pedestrian fatalities on San Diego’s streets and will increase city spending on bike facilities to $1 million. Councilmember Alvarez rides to a meeting.Photo via his facebook page. 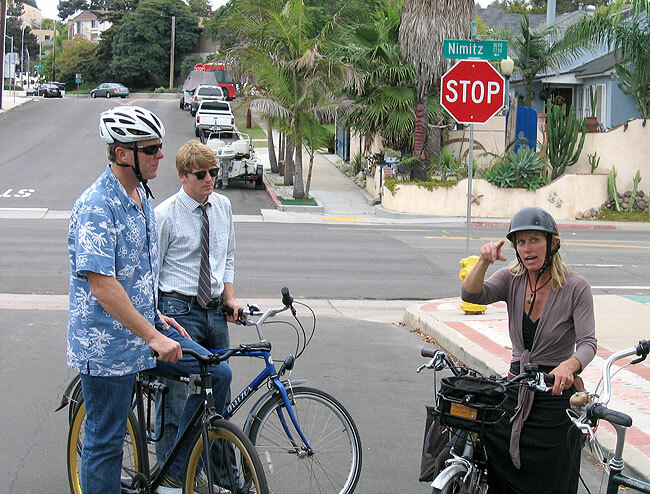 Councilmember Faulconer (in Hawaiian shirt), Council representative Michael Patton (with tie) listening to founder of District 2 bike/ped working group, Nicole Burgess, explain exactly why Nimitz Boulevard could become safer with some design treatments. Supported the development of the Bayshore Bikeway, a world-class bike route around San Diego Bay. As a member of SANDAG’s Bayshore Bikeway Committee Kevin worked to make improvements to the bike route around the San Diego Bay. The Bayshore Bikeway is a 24-mile bicycle route around the San Diego Bay. Additional improvements to the Bayshore Bikeway are based on the Bayshore Bikeway Plan to develop a continuous Class I bike path that would allow bicyclists to ride all the way around San Diego Bay on a dedicated path away from city streets. Implemented an innovative bike-sharing program. Kevin collaborated with former Mayor Jerry Sanders to implement an innovative public-private partnership between the City and Deco Bike, a national bike-sharing company. Without any cost to taxpayers, approximately 220 bike-share stations with bikes available to the public will be installed across the City to encourage alternatives to motorized public transportation or private vehicles helping to reduce traffic congestion, noise and air pollution. Supported the construction of the pedestrian bridge over Rose Creek to complete the route around Mission Bay. Kevin played an integral role, first as the Chair of the Mission Bay Park Committee and later as a Councilmember, in completing the Rose Creek Pedestrian Bridge. The bridge connects the bike path around Mission Bay, improving accessibility and safety for bicyclists. Other sustainable initiatives. Kevin supported the installation of 117 electrical vehicle charging stations across 27 locations at parks, libraries, recreations centers, and streets throughout San Diego. He voted to expand the partnership with Car2go to bring an innovative car-sharing program to San Diego that helps reduce congestion and improve connectivity to alternative transportation options. Kevin was also proud to support legislation to allow residents to start community gardens without having to obtain an expensive permit. These improved regulations allow greater access to healthy, local, and sustainable food. Supporting the implementation of the San Diego Bike Master Plan. There is a growing need and desire for safer, more accessible bike routes to decrease traffic congestion and create more livable neighborhoods with connectivity to transit routes. The City recently completed the San Diego Bike Master Plan, a long-term vision to create an urban network of safe bicycle routes which will improve bicycling throughout the City of San Diego through 2030 and beyond. Emphasizing smart growth and transit oriented development. San Diegans want less congestion and more livable communities. One of the most effective strategies for creating livable communities is to construct new development close to transit corridors. Kevin is committed to working with SANDAG and other regional stake holders to help San Diego implement smarter development policies. So who is your preferred candidate and why? * Most of the accomplishments also included Councilmember Alvarez’s involvement and support.